Do you really know who you're talking to? Writing technologies are always changing. Currently, we are in a shift from a print based text to electronic text on a screen. Major writing technologies have shifted over time from the printing press to the typewriter to the word processor. When these technologies are first introduced, resistance is always a typical reaction. It is usually due to the fact that people are comfortable with the current technology, so they give the cold shoulder to a new and more efficient one. For instance, my grandmother still writes and mails letters despite the widespread use of E-Mail. She claims that writing letters is more personal. As a digital native, I look at this idea as foolish because E-Mail is instantaneous and does not require the cost of a postal stamp. People tend to fear the unknown, which is likely why any new technology is not viewed in the best light when first introduced. Users of the current technology, such as books for instance, know that taking on a new writing technology will require them to also forego one in which they are content. This current switchover from print to digital text is interesting, because we are currently living through this change. I now own both printed and electronic books, creating a bridge between the two writing technologies. I am not alone in this type of book collection. However, many people are resistant of the new electronic books, or e-books, that are read from a screen, claiming that it lessens the quality of the book itself. It is safe to say that “because the tension between print and digital forms, the idea of the book is changing” (Bolter 3). Curling up with a good story today means it could be a book or an electronic tablet. 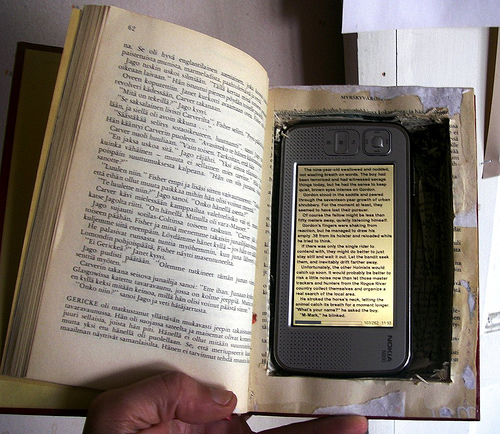 No longer does a book have to require physical paper pages, but also has the option of virtual ones as well. In the fast paced digital age, immediacy is an essential tool to success. While printed text has permanence; virtual text has the ability to be altered and extended. For instance, anytime I am composing a paper and want to help my reader to further understand my topic, I usually add a hyperlink into my text. This allows for the reader to click on the link and be taken to a webpage that will help them gain even more insight. These hyperlinks are instantaneous, and have the ability to link to any web page in existence. (Try clicking on the Bolter link!) Because our society places a high value on speed, “claims of greater immediacy are constantly being made, as new and old media vie for our attention” (Bolter 26). Both digital and print are in a tug of war of popularity. However the winner will be the one that provides the greatest immediacy to its users. Based on my experience with both writing technologies, I think it is safe to say that the printed text will eventually lose this battle. Reflections of the Pecha Kucha. Will Grayson, Will G… on John Green!